Richard M. Daley, the current Mayor of Chicago, is a knucklehead. I don't say this lightly. I say this because, although Richie is the Mayor of Chicago, and is a hell of a lot richer and influential than I am, the guy really does not have a clue as to how to fight crime. Daley, and mayors in other major cities, would rather place the blame for violet crime on gun makers instead of taking a tougher stand against gangs and thugs. However, the courts are not making life easy for Richie the Dummycrat. 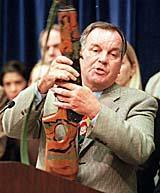 On Friday afternoon, Sept. 15, 2000, Judge Stephen Schiller of the Cook County Circuit Court, granted a motion to toss out Richie's $433 million dollar lawsuit against gun manufacturers and gun dealers. This was a major defeat in Richie's attempt to go after the gun industry and make them pay for the damages "caused" by firearms in the City of Chicago. Dummycrats like Richie are anti-gun in the first place. Organizations like the National Rifle Association, The Second Amendment Foundation, as well as firearm manufacturers of the United States, perceive lawsuit like this as an attack against the right of private citizens to own firearms and not a serious effort to decrease violence caused by mindless street gangs who would not be damaged by lawsuits against corporations that produce lawful products for law abiding citizens. Judge Schiller ruled that the City failed to prove that gun manufacturers cause a public nuisance by saturating the Chicago market with "cheap" guns that were marketed to criminals. Of course one has to ask what constitutes "cheap" to a drug dealer who can haul in thousands of dollars a week selling dope. Certainly an $800 top of the line handgun would seem "cheap" to a successful crook. Dave LaCourse, a spokesperson for the Second Amendment Coalition said, "We hope that Mayor Daley stops wasting taxpayers' hard-earned money on suing the makers of a legal product." Perhaps Daley and the Dummycrats should consider suing the gangs that actually cause the crimes instead of the firearm industry. Suing gun makers makes about as much sense as suing Ford for fabricating "Cheap" cars, which ultimately get used by gang members who perform drive by shootings that kill people. Cheap guns don't kill people, cheap Fords do. The "sue a gun manufacturer" mentality does not stop in the City of Chicago. In fact cities like Bridgeport, Conn., Miami-Dade County, Fla., and Philadelphia, Penn., have joined in these anti-gun lawsuits just as the federal government and local state governments joined in multiple lawsuits against the tobacco industry. However, there is good news for the gun industry and firearm owners in the United States. These anti-gun lawsuits have failed in four major cities because judges fail to see the validity of such lawsuits. "The plaintiffs have no statutory or common-law basis to recoup their expenditures," ruled the judge in Bridgeport Connecticut. A judge in Florida said, "Public nuisance does not apply to the design, manufacture, and distribution of a lawful product." Other lawsuits of this nature against the gun industry are expected to fail for the same reasons. Judges across the country are drawing the same conclusions. This leaves the Dummycrats with egg on their faces. Richard Epstein, a professor at the University of Chicago Law School said, "They should lose…. these are not serious legal cases. They are straight political actions. I think the mayor is a wonderful advocate for the city of Chicago . . . . But it offends me as a lawyer to see these perversions of stable legal theories for political ends." Anne Kimball, a Chicago lawyer who represented Smith & Wesson Corp. and other gun makers said that the judges saw that the firearm industry cannot control the actions of criminals. As a humble servant of logic, I can only see criminals, and a larger police force capable of controlling the actions of criminals. Lawsuits brought against the firearm industry are meant to pass the blame of violent crime from poor city management to the firearm industry. Let's not forget the fact that gun makers have very deep pockets. The city could sue gang members for damages, but what could the city expect to make from a looser? What are the roots of crime? What can be done to lower the crime rate in the United States? Let's look at Cook County Illinois. The City of Chicago is within Cook County. In 1999 there were over 700 murders in Chicago. Daley claims that 460 of the murders were committed with guns. I do not have the numbers at this time, but it is a known fact locally, that it is much safer to live in the suburbs of Cook County than it is to live in Chicago. Chicago's murder rate stands out like a sore thumb. In many suburbs around Chicago, it is rare to have a homicide. So what is different about the suburbs vs. the City of Chicago? The most obvious answer is the poverty that engulfs Chicago. In Chicago, there are whole neighborhoods of people that live in third world like conditions. These neighborhoods are as large, if not larger than many of the small towns that make up the rest of Cook County. These parts of Chicago are riddled with joblessness, homelessness, hopelessness, drugs, gangs, poverty, and multi-generational welfare families. If you put a red pin in the map of the City of Chicago designating the location for every murder that is committed there, you would notice a pattern. The red pins would be concentrated in the poorest of neighborhoods and the housing projects. This proves the link between violent crime and poverty. Almost all violent crime is committed in the poorest of neighborhoods. Take a close look at the people who populate the State Prisons of the United States and you will see people who were raised under the worst conditions from the poorest neighborhoods. So one does not need to be a rocket scientist to figure a solution to lowering the crime rates in our major cities. Just about any cop in Chicago can tell you that there are too few cops chasing too many gang member and crooks. Obviously, Chicago needs to hire more police officers that work special tactical units that deal with gangs. Cook County needs to hire more prosecutors that go after violent offenders. More pressure needs to be put on gangs to reduce the crime rate. But most of all, poverty issues need to be addressed. As long as there is poverty, hopelessness, and all the problems that poverty creates, Chicago, as well as other major cities, will not see a significant reduction of crime. Lawsuits against gun makers are an insult to anyone who understands what needs to be done to lower the crime rate. But Where are We Going to get the Money for such Programs? Politicians never seem to be at a loss when it comes to raising money for multi-billion dollar road projects. NASA spends billions putting things into space, the National Security Administration, according to their web site, takes about a billion dollars a day to run, [the NSA spies on our EMAIL with some of that money!] and the military spends billions on new weapons every year. Yet for some reason no one wants to spend billions of dollars on poor people who concentrate in our major cities. Money needs to be spent on more police, prosecutors, job training programs, and "off the street" programs for kids to keep them out of gangs. Companies have sharp attorneys to lobby for these billion dollar programs that keep NASA, Boeing, and other public/private companies going. What sharp attorney lobbies for poor neighborhoods? Politicians should spend more time focusing on the Roots of Crime. Instead, Richie, and other Dummycrats, waste that time with stupid lawsuits. This is why I think Richie is a knucklehead.